Oklahoma's usual Monday press conference did not come without Baker Mayfield news. The junior quarterback's status for OU's season finale at Oklahoma State remains questionable. 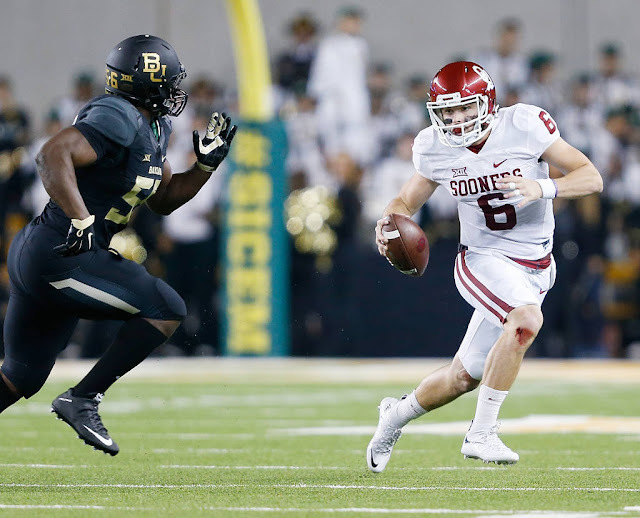 But Mayfield and coach Bob Stoops gave a promising update as to whether No. 6 will be ready for his first Bedlam matchup. "He has checked out after the game, passed all protocol and tests they give," Stoops said. "Yesterday, he passed all those tests. He will do some physical exertion work today — maybe some team stuff. "If he continues this way with no issues like yesterday and so far today, then he is expected to play."